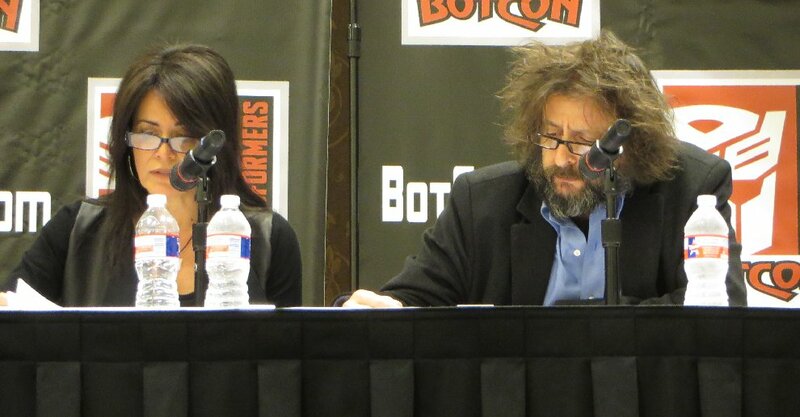 As with all the panels on Friday, the Script Reading started late. The Script Readings are always very short (this one went for about 22 minutes), so it didn't have to worry about going past its finish time... but it isn't good to have any BotCon event start very late. While waiting for the Voice Actors to arrive, a couple of the creative people behind today's story, and Animated in general, were waiting at the front of the room. 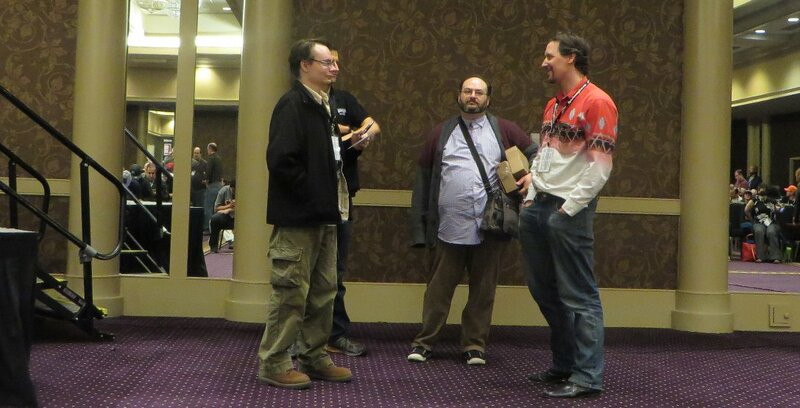 At about 1.10pm the voice actors were introduced, entered the room, and hopped up on stage. 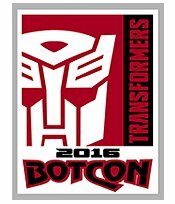 They are playing the following characters, in a story that follows on from the events of this year's BotCon Comic. 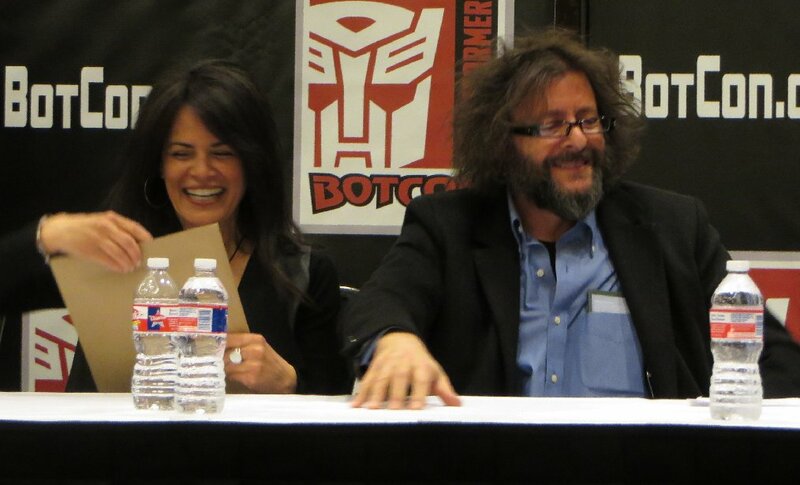 Gregg Berger - G1 Grimlock and Big Convoy. David Kaye - Lioconvoy and BW Megatron. Venus Terzo - Blackarachnia and Legend Convoy (this appears to be a new character for this story as there is nothing on the tfwiki yet about her, other than her being on the Primal council in the BotCon comic). 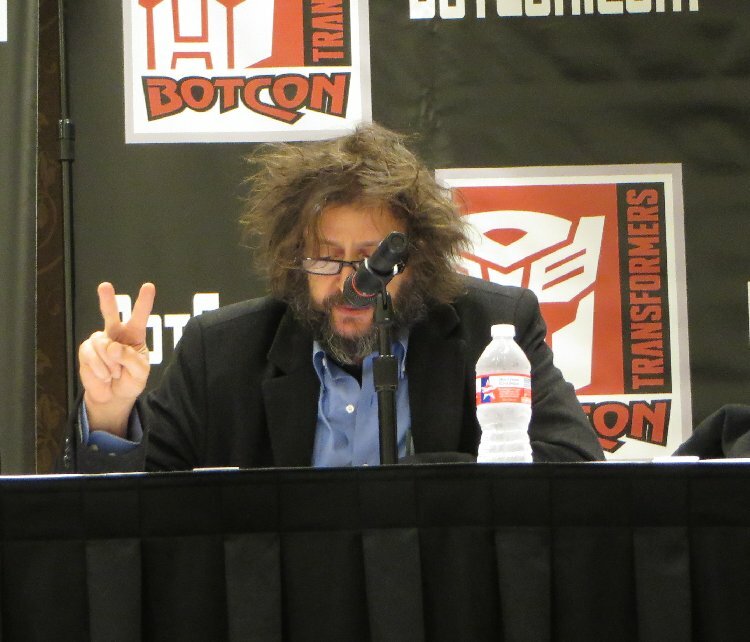 Judd Nelson - Hot Rod/Rodimus. The story was very confusing, as it involved the "playback" of several recordings, during the time just after the Decepticon Surrender (in the comic). The introduction by Pete tells that the story is about Hot Rod investigating the new Megatron's attempt at destroying a reactor core to destroy many Autobots. It starts with Big Convoy talking to Legend Convoy and Lio Convoy, about a virus knocking out Cybertronians and Megatron using their bodies as raw materials for building drones (after listening to the script reading three times I finally figured out that this bit at the beginning is set just before Beast Machines cartoon starts, as Megatron is taking over Cybertron before the Maximals arrive). For these Convoys to find out more about this Megatron, they play back some recordings done at the time of the armistice when this particular Megatron first showed up (in the BotCon Comic). The first one is a recording by Hot Rod, commenting on the changes lately, including the new allegiences, and regretting once calling himself Rodimus Major. The recording then has Hot Rod interviewing "Blackarachnia" before she had that name (sounds like Whitepropionica), to tell him about the events at the power plant on the morning of the armistice. Her recounting of that morning ends up being a recording within the recording of her interview with HotRod (I said it was confusing). So this recall of hers starts with her at the reactor and Megatron shows up, to record her voice print, and uses it to open and decrypt a secure computer terminal... which he then uploads a cyber-virus. Before Megatron can get away, Gen1 Grimlock shows up stop him. Now we are back to the original recording of Hot Rod interviewing Blackarachnia/Whitepropionica, and he mentions that the reactor didn't end up blowing, and neither of them know why. So we go to the next recording, of Hot Rod's interviewing someone who sounds a lot like Dinobot (but doesn't give his name, and hasn't yet taken on that BW name yet). Dinobot recounts a fight between Grimlock and Megatron (or Predaking, I'm not too sure), and noting how impressed he was with the actions of both of them. He recounts the last words of Grimlock before he went offline, as "Me Grimlock not Die, me Di-nobot)... to which Dinobot notes as being a name of honour. The third interview recording is then played - interviewing Megatron, to get his take on the battle with Grimlock. Much of it was Megatron rambling on (as usual), and then concedes that he was defeated by an "outdated, rusted jointed" Dinobot, and the reactor and virus was fixed by some unknown party. Hot Rod verbally spars with Megatron, recounting his achievements in the past as Autobot Leader. The fourth interview to be played was with Blackarachnia/Whitepropionica again, who plays a recording (yes, again within a recording), of Gen1 Grimlock foreseeing the events of this day from when he got his heightened intelligence (the cartoon episode Grimlock's New Brain), and left a message within the mainframe as an AI, that then prevented the reactor exploding and destroyed the Cyber-virus. The final recording from Hot Rod notes that Grimlock saved the day again, and comments again about the future with the prospect of taking on a new smaller, slower form and name, and wonders if the Predacons will eventually pick up where the Decepticons left off. Signing off, he says that he will be back. Now we are back at the original conference between the three Convoys (at the beginning of the time of the Beast Machines), realising that (BW) Megatron has tried to use this cyber-virus before (in the BotCon Comic), and need Grimlock... but is already struck down from the Cyber-virus. They then have to resort to hunting down Hot Rod and anyone else that left Cybertron to avoid going through the downsizing upgrade. Legend Convoy suggests using the old Wreckers frequency to contact him. (see the 2001 BotCon Wreckers comic, set during Beast Machines - this would tie in a bit with that story, as a reason why the Wreckers returned to Cybertron during the Beast Machines era... not perfectly fit with it, but pretty close for something written 15 years ago). 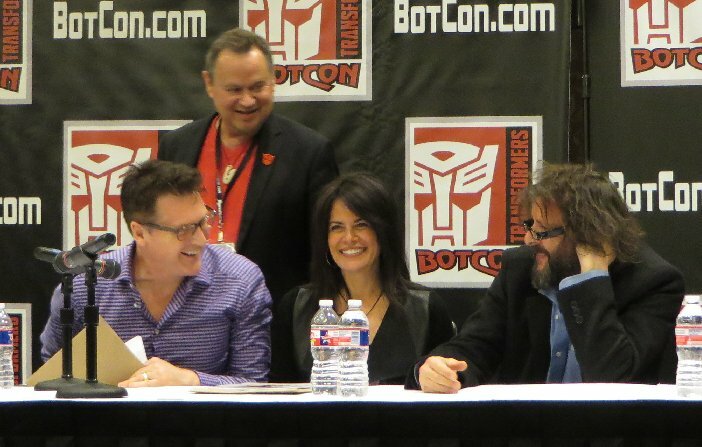 Some close-up photos of the Voice Actors. Judd Nelson... I hope he is preparing for TV/Movie role of a homeless guy. At the end, the five doing a group photo. And just the four Transformers voice actors.